This morning was my final dealings with the Japanese Noodle bar that I was working with. I collected my wages, then headed over to Centrelink. Apparently some names are tricky to synchronise in the Australian MyGov system as the first and last names need to match with each other. The consultant fixed this problem rather quickly. 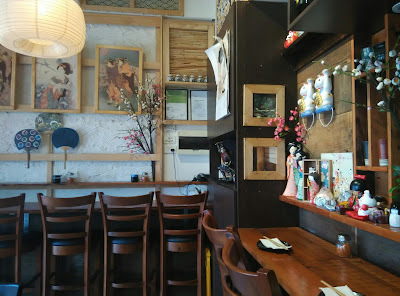 Then I had lunch at this cute and cosy Japanese bar in Campsie, Ishiyama. How do I like the place? It's not too bad actually. There is cute japanese decor, with a japanese bar you can look and see what the chef is doing. 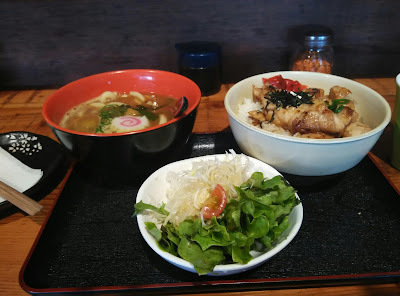 They do serve aburi, donburi, bento sets, and ramen. Their range of ramen and udon is a limited so don't expect too much. Lunch set was about 11 dollars ish for a half teriyaki chicken Don and half Udon. I sat on the bar, as I wanted to see the chef. After lunch, I decided to finish a couple of other errands, amongst which is to head to the Campsie library for a couple of hours to research and borrow some resources. I have decided to deactivate from FB for a couple of days as I'm feeling a little mentally tired. Since I decided to start a small home based business, my mind has been a little preoccupied. 7 and said to the entire Israelite assembly, “The land we passed through and explored is exceedingly good. What I would like is some supportive and encouraging words from people, not words that are condemning and discouraging, telling me how difficult setting up a business can be. No doubt there will be a lot of legislative and paperwork, but that's part of the deal with any kind of work worth doing. What people need to understand is when you have a business with a good support system set up, and well trained people, you as the coordinator need not be there to supervise. Just look at Richard Branson. Does it mean he has to know how to sing, dance, act, fly a plane, be a nurse just because he owns all his businesses? That doesn't make any sense. He has got good plans, able to think out of the box, good advisers and strategists, and that's what you do with money. Pay good and well trained people to do the job so it frees up your time for more financially viable pursuits. You don't even need to worry about job loss because you are the one creating it. Strive not but be at rest. Third day back in Kuala Lumpur. Buying a car in NSW with a foreign license. Comparing Bank Service Wait Time. Keeping off the small things in life.